As a transfer student, you’ve already gone through the college application process at least once before. The good news is, you know what you need to get done and are familiar the process. Your timeline may be a little more liberal (sometimes transfer applicants don’t have to submit their applications at the same time as first-time applicants), but you still need to make sure that everything gets done on time without letting your grades slip in the process. Download this printable timeline if you'd prefer to see your tasks on paper. Explore the graphic below to get a general idea of your timeline. If you're looking for more detailed information or links to relevant articles, refer to the text below the graphic. Choose the college(s) to which you’d like to apply. Get in contact with their admissions staff and plan visits to ensure that the institutions you choose match your needs. Look up transfer application deadlines. 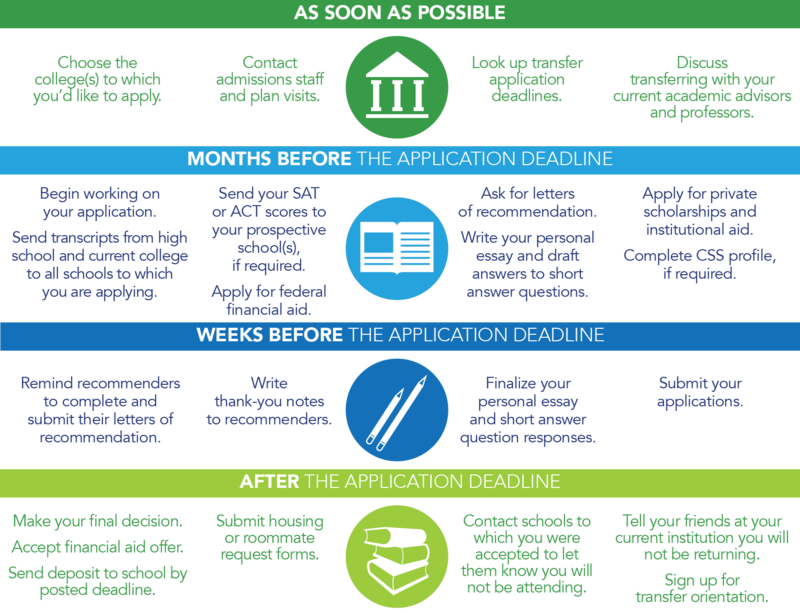 If you want to start at your new institution in the spring semester, your applications may be due anywhere from August to November. If you want to start during the fall semester, your applications may be due anywhere from March to July. Some schools may also have rolling admissions, meaning that the application is open as long as spots for incoming students remain in the class. Spots fill on a first-come-first-served basis, so you should apply early for higher chances of acceptance. Talk to your current academic advisors and professors about the possibility of transferring. Explain your reasoning, but don’t bash your current institution. Ask for help if you need it. Maintain attendance and high grades in your current classes. Begin working on your applications. Contact both your high school and your current institutions to have your transcripts sent to your prospective school(s). Depending on what semester you plan to start at your new institution, you will also need to send your midyear or year-end transcripts. Send your SAT or ACT scores to your prospective institution(s) if required. This can be done through your College Board or ACT Student account. You will have to pay for this service. Apply for federal financial aid by filing the FAFSA. The application opens each year on October 1. Depending on your application deadline, you may have already completed the FAFSA for the calendar year. You can have the results sent to your prospective institution if that is the case. Be aware that you may lose money if you do a midyear transfer or transfer to a school with a different cost of attendance. If you have not already completed the FAFSA during the calendar year, do so as close to October 1 as possible. Ask your current professors or advisors for letters of recommendation. While it is okay to ask for a letter of recommendation from a high school teacher, you should try to find someone who knows you academically at the collegiate level. This will make more of an impact during the admissions process. Your prospective institutions may require that letters of recommendation come from certain types of people; check your admissions requirements before asking anyone. Begin writing your personal essay and drafting your answers to short answer questions. Apply for private scholarships and institutional aid. Complete the CSS Profile if it is required by your institution. Remind your professors, advisors, or teachers to complete and submit their letters of recommendation if they haven’t already done so. Write thank-you notes to the individuals who wrote letters of recommendation. Finalize your personal essay and short answer question responses. Compare your acceptance offers and make your final decision. Accept your financial aid offer. Send in a deposit to the school where you will be attending by its posted deadline. Submit any housing or roommate request forms required by your institution. Contact other schools to which you were accepted and let them know you will not be attending. Tell your friends at your current institution that you will not be returning. Sign up for transfer orientation at your new institution.